TUNIS, Tunisia - Tunisia on Monday temporarily shut down all of its high schools and universities as it tried to stop deadly riots over joblessness and poor prospects for youths. At least 14 people were killed in unrest this weekend. Tunisia's president went on national television and announced a plan to create 300,000 jobs over two years in the North African nation. President Zine El Abidine Ben Ali also blamed rioters for what he called "terrorist acts." Demonstrators have attacked public buildings and set cars on fire during more than three weeks of unrest, while police have opened fire on rioters several times. Washington has expressed concerns over Tunisia's handling of the situation, and its ambassador was summoned Monday to the Foreign Ministry. 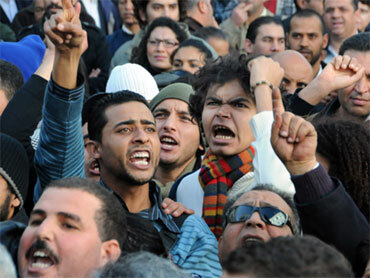 Tunisia's Interior Ministry said 14 people died in unrest this weekend. An opposition figure, however, said that 25 people died from police bullets. The unrest in the popular tourist destination on the Mediterranean has embarrassed the government, which tolerates little public dissent. The riots began after a 26-year-old man with a university degree set himself on fire on Dec. 17, after police confiscated his fruits and vegetables for selling them without a permit. The desperate act touched a nerve with educated, unemployed youth nationwide. The young man later died. The rioting has scarred cities and towns around this small North African country of 10 million people. Unemployment is officially around 14 percent but is believed much higher in rural areas and among youths. The ministries for education, higher learning and scientific research released a statement through the official TAP news agency on Monday saying that classes and exams will be suspended starting Tuesday until further notice. The statement said there will be investigations to find "those behind these troubles, and those who pushed innocent students to commit acts of disorder, violence and anarchy." The president placed blame Monday on "hostile elements" abroad, saying they were directing the unrest from afar. That remark was seen as a reference in part to Tunisian opponents and Islamists in Europe. "The law will have the last word," Ben Ali said. Among the economic measures he announced was a plan to do away with taxes for business projects that create jobs in rural regions. Ben Ali has ruled his Muslim nation with an iron fist since taking power in a bloodless coup in 1987, and outbursts of public dissent have been extremely rare. Last week, U.S. State Department spokesman P.J. Crowley urged all sides in Tunisia to show restraint. He said Tunisians should enjoy the right to protest publicly and expressed worries about a crackdown on social media in Tunisia. He also said the U.S. summoned the country's ambassador to express its opinions. In return, Tunisian Foreign Ministry official Saida Chtioui told Washington's ambassador to Tunis, Gordon Gray, of authorities' "surprise" at the U.S. reaction, TAP said. Tunisia's government also said authorities do not intervene or ban peaceful demonstrations, but recent protests have become violent. Until this weekend, only two people had been killed in the weeks of rioting, the government has said. An Interior Ministry statement said there had been 14 deaths this weekend but did not give the circumstances. However, it invoked "legitimate defense" to explain the police's use of weapons. Ben Ali said officers had been injured, without saying how many. Opposition leader Ahmed Brahm put the weekend death toll at 25 and said all the victims died from police bullets. He pleaded with authorities to stop firing on protesters. "Let's save our country while there's still time," Brahm told the AP. In neighboring Algeria, meanwhile, three people died over four days of rioting, the Interior Ministry there said this weekend. Algerian youths took to streets to protest rising prices of staples like sugar and cooking oil. The Algerian government announced Saturday it was slashing taxes on those products by 41 percent.